We don’t live in a world where we have the luxury of thinking about just user experience or just SEO. The two share many of the same spaces online, working in tandem and sometimes even clashing. 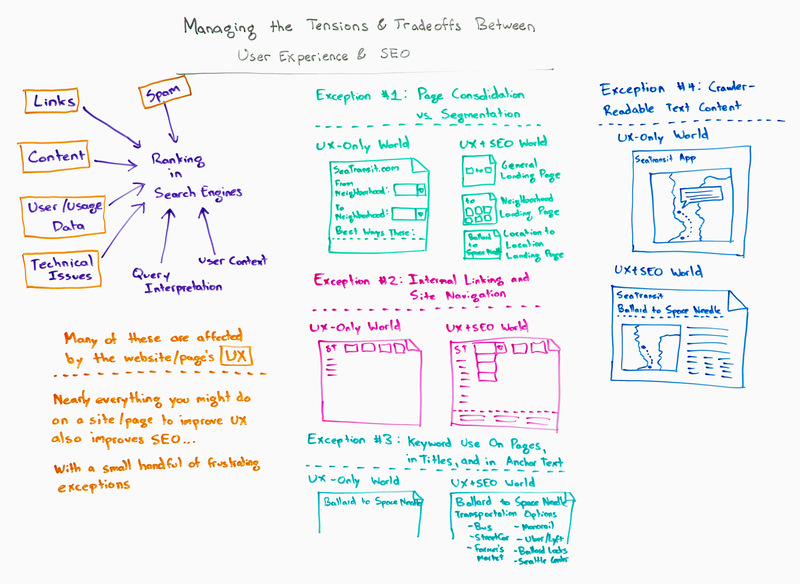 In today’s Whiteboard Friday, Rand details the considerations and compromises that must be made for UX & SEO to coexist in harmony. Howdy, Moz fans, and welcome to another edition of Whiteboard Friday. This week we’re chatting about managing tension between user experience and SEO. This is a topic we’ve touched on a little bit in the past, but we’ve seen it come up quite a bit as many more folks are thinking about user experience and working with user experience designers and product and project managers and SEO. They’re trying to reconcile some of these differences. But regardless of this, nearly everything you do that’s on a site or a page that’s going to positively impact user experience or negatively impact user experience will have a corresponding impact on SEO, with a small handful of exceptions. The small handful of exceptions is where we see a lot of these tensions and challenges coming into play, and that’s what we’re going to discuss today, specifically four kinds of tension that can exist. So what I’m going to do is ask you to imagine two worlds, one world in which there is no SEO. It’s before search engines. We’re just worried about the user experience. People only come to your site through the site itself, and they only navigate through the website. They don’t navigate from engines directly to your pages. They’re not performing searches. We’re UX-only world. So page consolidation would be, I’m going to put a bunch of different user intents all together on a single page because we can serve users best from that single page, single experience. That is true in UX-only world. But what has happened is that you’ve forgotten about UX+SEO world. I’ll give you an example here. Let’s say I’m trying to make a website all about transportation in the Seattle area. I want to provide people with how to get to and from places, and the best times to go, and are you thinking about traffic, and are you thinking about comparing public versus private transport options, and driving versus Lyft versus Uber versus renting a car, all these different kinds of things. I’m covering the whole world of Seattle transit. But in UX+SEO world, we have to remember that somewhere between a third and half, sometimes even more of our traffic is actually going to be searching on Google for what we provide. They’re not going to be going directly to our website and then experiencing the site only through that. They’re also going to be searching on Google, and that means they’re going to be searching with all different kinds of queries. If I’m only thinking about UX and not SEO, I am not serving these folks well. In fact, I’m hurting the user experience of anyone who searches for me or who might come to me through a search engine. Because landing on this page, if I’ve already expressed to Google that I’m looking to go from Ballard to the Space Needle and I want my options, that’s a lousy experience. I have to go enter that information again. I already told Google what I wanted. Your website should be delivering that. So this is one of those areas where we have to make the sacrifice and live in UX+SEO world, recognize this exists, create landing pages that specifically serve the needs of searchers and provide that great experience for them. Those pages have to be linked to. They have to be indexable. They have to be keyword-targeted. They need the right kinds of content on them. It’s different than pure UX world. So in UX-only world, I can have a much more limited set of onsite navigation because I don’t have to point to nearly as many pages and because, in general, I can rely on the intuition of my users to be able to figure out that oh, this particular page probably lives in this particular section. If I want to go from neighborhood to neighborhood, I can look at the neighborhoods landing area. Or if I’m particularly interested in comparing costs of different kinds of vehicle rentals versus getting around the city with Lyft and Uber versus that kind of thing, I can go to the transportation options section. But in UX+SEO world, again because we have different types of landing pages, we generally speaking have to link to much more, and so that might mean instead of a single section we actually need drop-downs. We need to have more navigation. Maybe we need to even put in a footer or have some more sidebar navigation. We may need to make a little bit of a sacrifice for the purity of user experience for someone who’s not coming from search in order to link to more things and in order to provide better internal anchor text. These links are going to need good internal, descriptive anchor text. That is not actually just helpful for search engines. This is actually quite helpful for folks who may not have the same intuition that you’re assuming many of your visitors might have and for folks who are looking to quickly navigate directly, potentially on a mobile device or on a screen reader for those folks who have more trouble with accessibility issues. This is positive from all those perspectives. That internal anchor text, as we’ve discussed previously on Whiteboard Friday, can have quite a positive impact on your search rankings. So in UX-only world, I might have a page that’s “Ballard to Space Needle.” Great, that’s all I need to say. But in UX+SEO world, I need to show the search engines and, indeed, the searchers themselves that I’m very relevant to their query, that I’m answering exactly what they are looking for before they get to this page, because, remember, all they’re going to see in the search results is just the title and the description maybe, whatever is in that little snippet. They’re not going to know, “Oh you know what, they probably provide a great experience, but it’s very visual and interactive and so I just can’t see it. I’ll click them anyway.” That is not how people search. They look at that snippet. They decide whether they’re going to click and engage. So we need to present a better, more optimized version of the page for search engines specifically. In this case, what is also true is that there’s probably a bunch of words and phrases — what we’ve called here at Moz related topics — related keywords, related topics that I should have on this page. If I’m talking about going from Ballard to the Space Needle, I probably want to include words like bus, streetcar, farmers market, the farmers market in Ballard, or Seattle Center (which is at the base of the Space Needle surrounding it), monorail, which there is a monorail. It won’t get you from Ballard, but it will get you from downtown to the Space Needle. Uber and Lyft. These are all words and phrases that Google would expect someone who’s interested in transportation between these neighborhoods to want to find on this page. Therefore, we need to do a good job of serving those searcher intents and those related topics that Google cares about. In UX-only world, that’s not always the case. In fact, if you think about UX-only world, an app might be the very best type of experience. That could be a web app, or it could be a mobile app, or interchangeably both. It could provide a great experience by letting me just click around the city and know where I’m going and select things from inside the app. The URL would actually never change. We need descriptive content. We need to be able to navigate between pages. We need separate URLs for each of these. Those URLs need to have good anchor text that’s pointing between them back and forth. We need to have keyword targeting in all of the facets of that navigation. We need to figure out what all those keyword targets are, which requires keyword research. So there are just a lot of different changes that need to happen. My advice is this. If you’re an SEO and you’re working with user experience folks, please remind them that the user experience doesn’t just apply to the people who are already on the site or navigating internally in the site. Search engines send a huge amount of traffic, and we need to think about the user experience of coming from a search engine to the website. It’s not just about rankings and traffic. It’s about the user experience that those people have as well. If you’re a user experience professional and you’re working with SEOs, with the exception of these few things, generally speaking everything that you do to improve user experience — the UI itself and the visuals, the design, the branding, the load speed, the efficiency that people get between pages on a site — all of those experiential elements also improve SEO. So as a user experience professional, your pitch to SEOs should be, generally speaking, very easy because you can help them rank better so long as you keep these things in mind. All right, everyone, look forward to your comments, and we’ll see you again next week for another edition of Whiteboard Friday. Take care. When it comes down to it, your job is to get stuff done. If you’re in marketing, it doesn’t matter if you work in-house, out-of-house, for a tiny company, or for the largest brand in the world. Your job is to get results. I may be biased, but building community sure does seem like one of the best ways to not only keep pace with the continuous change we’re experiencing in the web marketing industry, but also to achieve big goals for your business. There’s a lot of work that comes along with building a community, and it does take time. But it’s a powerful and sustainable solution to heighten brand awareness, build trust and reputation, establish the right connections, and lower the cost of customer acquisition. There’s a lot of ways you can build a community around your brand. We’ve found that there are some very fundamental pieces that will make building and managing your community a success (each conveniently falling within a five-step process). We’ve tried a lot of things as we’ve helped many of our clients (and ourselves) build community. We’ve found these five core steps, forming this fundamental structure and process, to be quite powerful. Hopefully you’re getting tired of hearing me say this by now, but you’ve got to set goals for your whole business, and not just for SEO or content or social media. These goals are the building blocks for the strategy and direction of your business (not just for your marketing or your community). You can have huge and lofty goals that are more visionary for your company and then also smaller, short-term project type goals that you have in mind for improving things, building things, and just overall stuff that you’d like to accomplish. Have a mix of both. When you get to the part where you’re developing your strategy, you can prioritize and plan for accomplishing all of these things. When setting goals, it helps with buy-in if you give everyone in your company a voice. That doesn’t mean that everyone and their mother comes to a goal-setting meeting. You can ask individual teams to send a list of their top three goals via email. The marketing team can organize, consolidate, filter, and then use these suggestions as a framework for what the company is looking to accomplish. The goals you set for your company need to go beyond revenue goals. Certainly the end goal of all of this community building stuff is to grow your revenue. Think beyond that, though, and include the direction that you want to take your brand. Think about how you can focus more on your customer and improving their experience. It’s okay for goals to be high level: “we want to be thought leaders,” or “we want to improve customer service,” but it’s your job to break those more visionary goals down by asking, “what does that really mean? What does that actually look like?” This will bring these goals down to a more granular level, so that you know what exactly what you’re attempting to achieve. When working with clients, we have found that they need our help getting focused and setting the right goals. So we normally ask them to provide us with a list of goals for their company as a whole (they can send departmental goals as well), and then we do a little discovery research in order to propose the set of goals we’d recommend working on. We present these proposed goals and discuss them both for buy-in and to set the tone for the work that’s ahead. Once you have goals defined, you’ve got to work on defining key performance indicators so that you can actually measure the goals that you have just defined (which translates to proving your value). The reason we define KPIs before we develop a strategy is for buy-in. We’ve found that it is important to have a discussion about KPIs to bring unspoken expectations to the surface. This provides an opportunity to get everybody on the same page. This provides the C-Suite (or whoever else approves your budget) with an opportunity to review the KPIs you’re proposing to serve as an indication of progress. It also allows them to provide their feedback for additional KPIs they’d like to track. From this conversation you can gauge whether you need to spend some more time on education and buy-in. Keep in mind that not everything is easily measured. And not everything is going to be measured in Google Analytics. Be creative with how you can prove the value of your efforts. Avinash has some great posts to get you thinking in this direction. Side note: I’m hesitant to provide examples of KPIs because they are going to be different for every company and every goal. Defining KPIs isn’t easy. It’s something dynamic for which you’ve got to test, collect data, and adjust. But don’t adjust the KPIs to tweak data to make your efforts look good. It’s okay to own up to data that doesn’t quite get you where you want to be in your initial iterations; that’s the contrast you need to figure out how your efforts need to be adjusted in order to get you where you want to go. Now’s the challenging (but fun) part. You’ve got to come up with creative ways to reach these goals you’ve set. Develop a strategy that will serve as your detailed road map. Hold a strategy jam session with a small group, and have everyone come to the meeting with ideas ready to roll. During your meeting, don’t filter any of the ideas. Just think up a list of all the creative ideas for reaching the goals you’ve set. After the strategy jam, schedule an additional meeting to filter, organize, and prioritize the ideas that made the final cut during the jam. This is certainly where you match up budgets (make sure you can actually afford to do what you’re proposing), team resources, and time frames for deliverables. Once the budget and resources have been vetted, you can throw a high-level outline of the strategy over to your boss, team, or client. That way, if they don’t like the direction you’re headed, you haven’t wasted time by flushing out any ideas in detail just yet. If you have to ditch something, no harm done. This also provides another opportunity for buy-in because you’re showing that you value their input by asking for their feedback. Once you receive feedback on your high level ideas, you’re ready to develop your road map in detail. When working on developing the detailed plan of your strategy, it’s probably a good idea to show all of the creative things you want to accomplish in the next 12 months (that vision or higher level plan), but then of course you want to detail the first 2-3 months on a day-by-day/week-by-week basis so that the whole team has a road map. Working in iterations of 2-3 months toward your goals will allow enough time to get some momentum and collect some data, but isn’t so long that you can’t change course if your ideas flop and you need to do something different. As you move along into the execution of all of this stuff, note that you’ll need to hold strategy jams every three months or so and repeat this same process. It’s a lot of work but makes such a big difference in results. As you’re planning out your creative strategy, now is the time to select the tools that are going to get the job done. Our typical set of tools for building community tends to be SEO, social media, content, email marketing, and outreach. Whatever it’s gonna take to accomplish your goals. Now that you have your plan written, get to work. Make sure the proper tracking and measurement is set up so that you’re collecting data on your KPIs. Then follow your strategy and be consistent. People on your team (and on other teams) are going to keep coming at you with things that will seem emergent but aren’t necessarily part of the strategy. This is where you get to tell them to “check the goals, baby” (and the plan that you’ve established that will get you there). There will be things (time-sensitive things) that may force you to derail your strategy. But be careful to stay focused on goals and keeping your attention on the actionables outlined according to the strategy. Part of your execution will most certainly be the daily management of your community (and I’ve provided some fundamentals on this below). Now’s your chance to figure out what’s working and what’s not. What needs more time? What are you missing? Analyze the data you’ve collected and then do something with it. Whatever you do, don’t be lame and adjust your goals or KPIs just to make your efforts look good. Part of the process of measuring this stuff is determining what works. You’re going to fall flat on some stuff. That’s what testing is all about (and that’s why you work in iterations of 2-3 months and allow for agility). As you build your community (and your business), remember that these are your bones. This is the stuff that will keep you grounded. No matter what comes at you as you’re growing your community, always bring it back to these five core steps. If you’re working on implementing the five core steps of community building, you’ve got your bases covered. So what about the fundamentals of managing this community? What is your community manager’s role? What are the key pieces that will be part of their job? How do they play a part in this community building stuff? So this is the way we work this at Mack Web, but you may have a different dynamic (working in-house vs. agency), so you can shape this however it works best for you. We have strategists who are responsible for developing and directing strategy and for analyzing everything they possibly can in order to make a difference in our clients’ businesses. In order to effectively do this and help those businesses grow their communities, they need to work in perfect harmony with the community manager. Depending on who you have on your community-building team, there will be someone (probably your CMO) who needs to operate like our strategists by keeping their fingers on the pulse of the business, setting goals, developing strategy, communicating with internal and external teams, keeping up on product development, engaging with customers, and executing all of the pieces that come along with the strategy so that everyone is getting stuff done and accomplishing goals. 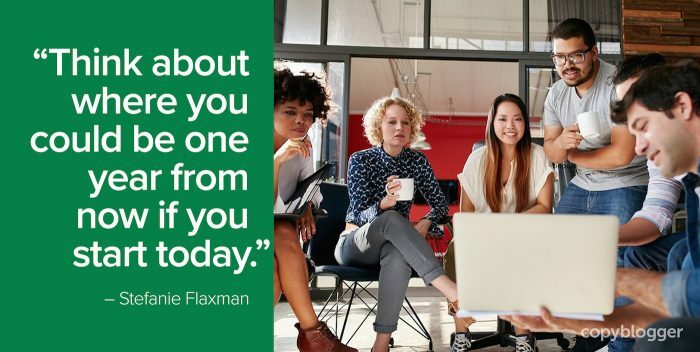 You’re going to have all kinds of other people inside of your company who are also playing a role in executing your strategy and building your community. Some people are going to write content. Some people are going to create assets like infographics and video. Some people are going to be reading and learning and sharing knowledge. Your strategist is responsible for leading this team. And of course, working closely with your community manager to ensure that they’re maintaining the thriving flow of your community. Certainly there is strategy to all of this good stuff. Community managers will work with strategists to develop actual strategy and ensure that the base of your community is growing. One of the biggest jobs your community manager has (as well as other people on your team) is to become a subject matter expert in your industry. But they also need to learn about tangential and related industries that may become vertical and new market opportunities. So the deal with reading and staying up on industry knowledge is that your community manager has to be a lot of places soaking up information that could be valuable to your company (or your clients). Your community manager will be responsible for doing the digging to identify the people and companies you need to be following on social media. This also means narrowing down the blogs you should be reading and engaging with. Again, you’re looking to strategically target an audience of both influencers and friends. These are the people with whom your community manager (and of course other key members of your team) are going to focus on building relationships. They’re going to share their stuff, ask them for feedback, and look for ways to engage them in your community. Monitoring and listening is a really important part of your community manager’s work. They’ll be watching for all kinds of opportunity in your community and on social media in general (more detail on this below). Ideally, you’ll want your community manager to find a community management mentor. There are so many amazing community managers to learn from. Your Community Manager will want to find a few to emulate and try the things they do with their community. It’s their job to add your company’s personality, style, and align with the goals that you are working toward. Depending on the size and roles on your team, your community manager could be the one to manage the content that goes on the blog. They can work on scheduling, launching stuff, and making sure there is a variety of content (see the Knowledge Spreadsheet idea below). Certainly, the community manager is an ideal person to engage with those who comment on your blog. And they can also make sure that spam is being consistently removed. Ideally you want all kinds of voices on your blog, and your community manager is one of them. In addition to being featured on your own blog, your community manager can be focused on finding other reputable blogs where your team can contribute knowledge. In alignment with your strategy, your community manager can take the WHOM they’ve identified (above) and seek out matches for guest blogging. Guest blogging on other reputable blogs is an opportunity to build relationships with key companies and influencers. It allows your company to find other possible communities to strategically attract to your own community by providing them value. Your community manager can find these opportunities and bring them to fruition. Your community manager is a bridge that connects all of the places where your customers and community members will experience your brand. They can help build that experience that connects the online and offline worlds with your website and social media outlets, the blog, and any other place that is an open door inviting people into your community and your business. Your Community Manager will continuously develop relationships both on and offline. They will go to events. Talk to people. Make friends. Among the most important friends that they will make are other community managers. There’s a kinship there that is key to forging beneficial partnerships and also learning to be a better community manager. Monitoring and listening is also part of engagement and is a big part of a community manager’s role. Social monitoring and listening is a dirty job. Seriously. It’s a lot of work. There are tools that can alleviate some of the pain, but when it comes down to it, monitoring and listening on social media requires a real human sifting through stuff other real humans are saying and that can be arduous. You really do have to be dedicated to sherlocking (which is the term we use to describe rooting around and researching and otherwise detecting) conversations, and doing what it takes to find opportunities that can be taken advantage of. A community manager’s job is to find those nuggets of opportunity, analyze them, and put them into action. Your community manager can be looking for possible partnerships, friendships, and relationships. All ways to help people, grow your community, and build your business. Another way to increase engagement and accelerate community growth is by embracing your community members in an expression of gratitude for their brand loyalty (something Joanna Lord discussed at MozCon). These efforts need to be tied to your overall company goals. Your community manager can research, identify, and suggest possible ways to reward your community members and encourage brand loyalty. Your community manager can create a brand loyalty program. A process they can use to decide how to reward your customers and your community (with all kinds of swag) and when such rewards should be given out. Cultivating brand loyalty can also come from performing “random acts of kindness” in your community. I remember Moz doing this when my cup broke shortly after returning home from my first MozCon conference. Just as with engaging, monitoring, and social listening, your community manager will want to keep track of all brand loyalty efforts so that you can evaluate the effectiveness of this program. This will certainly be part of setting goals, defining KPIs, and strategy development when you’re back working on building your community base. Whether your team is in-house or you’re working with clients, education is a really powerful part of your community manager’s routine. Especially because not everyone on your team is going to be overly excited about the power of community and using social media. As a community manager, you’ve got to rally the troops and get them to contribute to community management efforts. But they don’t need to be on social media to do this. I’ve talked about this hack before, but we’ve been using this internally to manage the Mack Web community and it’s worked so well for us (and our clients) that I’m sharing it again. This is a Community Management Knowledge Spreadsheet and it’s made a tremendous difference in the quality and variety of value that we’ve been sharing with our community. Remember when we talked about identifying the WHOM and finding targeted blogs to be reading and engaging? Share those sources with your team (and encourage them to provide you with others). Then ask them to contribute what they’re reading here on your knowledge spreadsheet. Everyone in your entire company can contribute here. Your community manager then plays bouncer and decides what is appropriate and useful for your community (making sure it’s actually a fit for your community), where it gets shared (be respectful that each outlet has different needs), and when. Getting your team to participate in ongoing learning is just one way to train your team ongoing and manage your community. There are going to be many other things that your community manager can do to contribute to the management and growth of your community. Your community management fundamentals may look entirely different. Again, it all depends on the goals that you’re wanting to accomplish for your business. Building a community is a great way to put integrated marketing into action (which is what is going to help you weather the Goog and build valuable assets in your business). These community building and management fundamentals will help you grow your community from the inside out. They will keep you focused on creating quality content and resources. They will encourage you to continually work on improving your products and services. They will motivate you to engage with and listen to your customers and their feedback. Using these fundamentals will help your entire team â strategists, community manager, and the rest â accomplish goals for your whole business. Have you tested these community building and management fundamentals in your company? What have I missed? Looking forward to our conversation in the comments below. Marketers often balance cost and quality when it comes to lead generation. Learn five steps you can use for managing the cost and quality of leads.